A skunk in Billerica, Massachusetts, got into a bit of trouble earlier this week after getting its head stuck in a beer can. 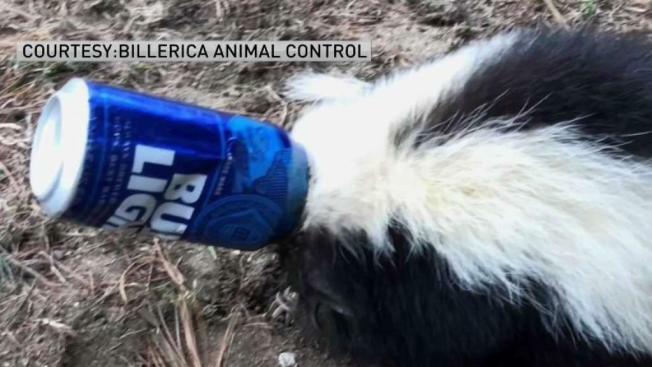 A skunk brewed up some trouble when it got its head stuck in a beer can, according to animal control officers in Billerica, Massachusetts. The skunk was picked up Thursday by animal control officers on Lucille Drive and taken to Tufts Wildlife Center in North Grafton, where it had to be sedated in order to have the can removed from its head. "The skunk's head was stuck in an aluminum can, which veterinarians were able to carefully remove after sedating the animal," Tufts Wildlife Clinic said in a statement. A picture of the skunk showed the animal’s noggin stuck in a 12 ounce can of Bud Light. One resident said she thinks the animal just unintentionally got into trouble. "I think it was an accident," resident Jannett Bonasoro said. "I don't think anyone would do that on purpose. Besides, if you got close to it, it would probably spray you, right?" Tufts said radiographs showed no injuries, and the skunk was found to be in good body condition. The animal has been cleared for release.